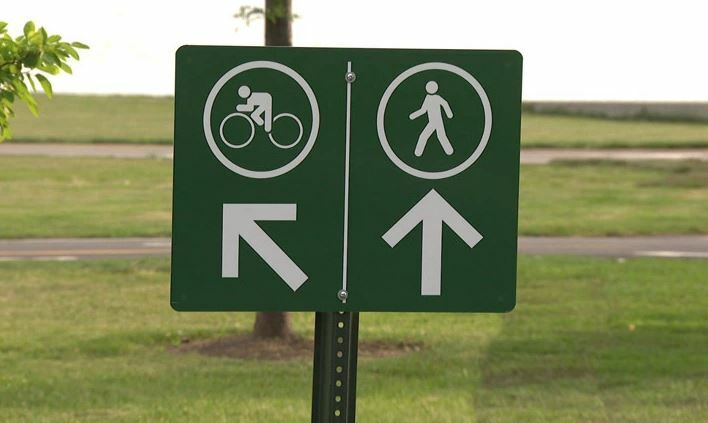 The Chicago Park District’s design for separate biking and walking paths on the Lakefront Trail between Ardmore and Montrose addresses a major safety issue by redirecting cyclists away from street crossings where cars funnel into and out of the park. However, what this busy trail really needs and deserves is to eliminate street crossings altogether with ramps, underpasses or street closures so that everyone can enjoy the trail entirely car-free. This would also allow the bike path to revert to its original alignment closer to Lake Shore Drive. The park district is in the final stages of a two-year process to create separate paths for people biking and people walking along all 18 miles of the Lakefront Trail. Construction on the Ardmore to Montrose segment was finished in September. The area around Montrose won’t be complete until the work from Montrose to Fullerton is done later this fall. Unlike other parts of the newly separated trail, in this northernmost segment, the bike path is closer to Lake Michigan and the pedestrian path is closer to Lake Shore Drive. People biking are directed to a newly paved path around Cricket Hill, adding a few minutes to people’s trip time. The park district chose this design because it minimizes dangerous road crossings for people on bikes at Montrose, Wilson, Lawrence and Foster. There have been several reported bike-car crashes at these crossings. Active Trans’ 2013 People on the Trail Report, using survey input from more than 1,600 users, identified the Montrose access point as having the greatest potential for conflict between people on the trail and people in cars and trucks. The new design directs people on bikes through an underpass at Montrose – the highest traffic street – and crosses Wilson, Lawrence and Simonds/Foster at slower traffic spots that are farther from the entrance and exit ramps to North Lake Shore Drive. People on foot use the trail closer to Lake Shore Drive, which is not ideal either, but recognizes that faster moving bikes are more susceptible to conflicts at trail street crossings. During construction this spring and summer, Active Trans heard from many trail users about the new routing. While many users said they appreciate the opportunity to avoid car and truck traffic, some said that the additional distance and time is a concern. We’ve also heard there are problems with people crossing the new bike path between ball fields and lakefront parking. In addition, we’ve received reports of non-compliance with the newly separated paths. Many people entering the park on bikes are using the first path they hit, which is now the pedestrian path. We see the new design as temporary until the remaining street crossings are eliminated by adding underpasses or bridges at Wilson, Lawrence and Foster, which would also allow the bike path to return to its previous alignment near Lake Shore Drive. Alternatively, the city can avoid building underpasses or ramps by closing these streets within the park. For example, close Wilson and Lawrence and build an underpass at Foster, which keeps Montrose and Foster open to cars. The Chicago Department of Transportation (CDOT) would need to work with the park district to make these changes. For more than a decade, Active Trans has pushed to create separate lakefront trails for people on foot and wheels. We’re excited this is finally happening, but there is more to be done in places such as Ardmore to Montrose. This incredible recreation and transportation resource is one of the busiest trails in the United States and warrants a car-free experience from end-to-end.